KaTnipZ Events: Ho Ho Ho... It's (Bloody) Christmas! 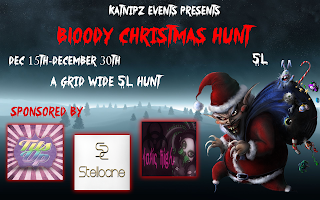 The Hunt starts today December 15th and ends December 30th! You have to look for a tiny bloody present and each prize is 5L. You can find all hints and prize reviews on our hint page on the left side. Please be aware that some designers may not be ready yet or dropped out. If this is the case just skip the store and teleport to the next one. If you need help do not contact the designers, you can find help in our KaTnipZ Events group. But posting SLurls in chat to the exact location of the gifts will result in exclusion of the group! If anything else comes up you can contact me (Kralicecik Dufaux) via NC, I will be happy to help you. But now it's time to go hunting!